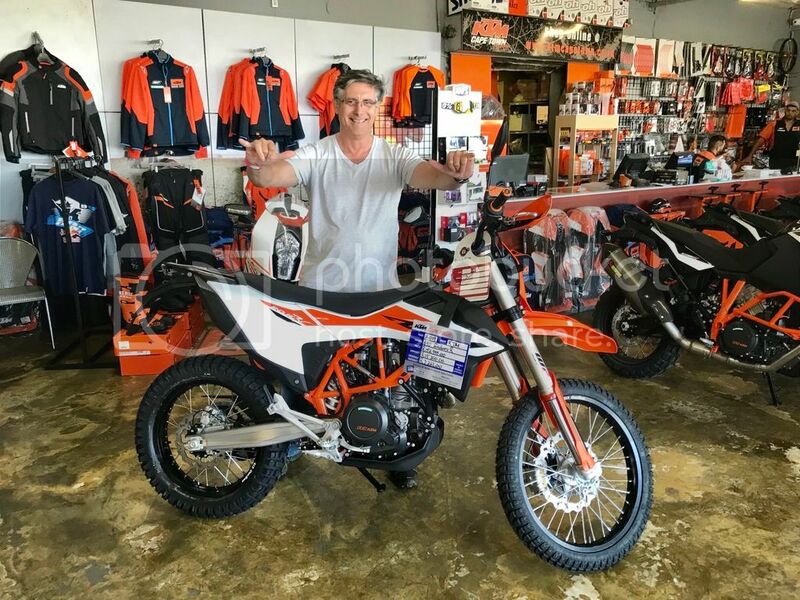 OK let me try again: I was Quoted R152K for a 2019 KTM 690 of which Stock will arrive in April or May by KTM Cape Town and Jo'burg. Indien die R se suspension laer gemaak word, vir ons ouens wat naby die grond leef, sal die bike nog dieselfde op gravel en teer hanteer/ry? Years ago I bought a new enduro bike, which was the same model the Western Cape Enduro championship was won on. I was familiar with this model as I had already owned one before. I asked the shop to set the bike up exactly like the championship winning bike, using the same suspension and engine mods and changes. The champion was a similar size and weight to me. It was a big mistake, I simply could not ride the bike, all the power was in the top end and the suspension was so stiff it felt like it had none at all. I hated that bike with a passion and used to kick it every time I went into the garage. After the second or third broken bone I sold it and went back to a stock standard bike, which I loved. Moral of the story is that the set-up for a racing winning champion does not work for a weekend warrior and can be plain dangerous. The manufacturers know this and save costs by supplying budget suspension which is good enough for 95% of their clients, especially on a bike not intended as a race bike. The Ready to Race slogan is a misnomer. Another thing, the KYB SSS suspension on my WR is supposed to be the best in the business. Well I can tell you that it did not work for me no matter what did with clickers and sag. Eventually I took it to MP would customized it for me and now it really is extremely good. Did I say one should have suspension set-up for racing? I don't think so. Look, I have been the guy using whatever suspension the bike came with and just rode it. And being ignorant I put the typical plaster on any handling issues I might have had (that I suspect other people also use) - i.e. steering dampener, instead of getting the root cause - suspension set-up sorted. Most people don't even set-up their static, let alone rider sag right (as that would very quickly show them they may need different springs). If it works for them - great. But in my experience suspension set-up are money best spent on new bike, instead of loud pipes (that often rob the power), power commanders, steering dampeners people often waste their money on (I know, I have been there and done it). It is clearly unpopular opinion here, but hey - that is my experience. No you did not say it should be set-up for racing, I was just passing on my experience and was trying to justify the cheaper suspension fitted on some of the new bikes. Not quite so simple, the 2015 WR250 came with an inherent problem with the shock set-up. I can't remember the whole story but it had something to do with the shock shaft being longer than the YZ. And with an inherent problem no amount of fiddling will get it to work properly, the root cause has to be dealt with. In the case of my bike MP took some length out of the shock by fitting a stopper on the shaft. The strange thing is that it affected the forks and not the shock. Well it would, as it was putting too much weight on the fork. Other than shortening the shock stroke, you could have ran a longer wishbone, stiffer fork springs (to a certain point, possibly not enough) or dropped the forks through the triples. Sometimes the roots cause is not the only option. I know the feeling well - when I bought my 701 (with less than 3000km) the difference with new was R50K - I could not substantiate it. Need to go stop there today!